HCM CITY — Visual artist Ưu Đàm, known as UuDam, will be displaying his art in an interactive installation at Galerie Quynh in HCM City beginning on April 19. 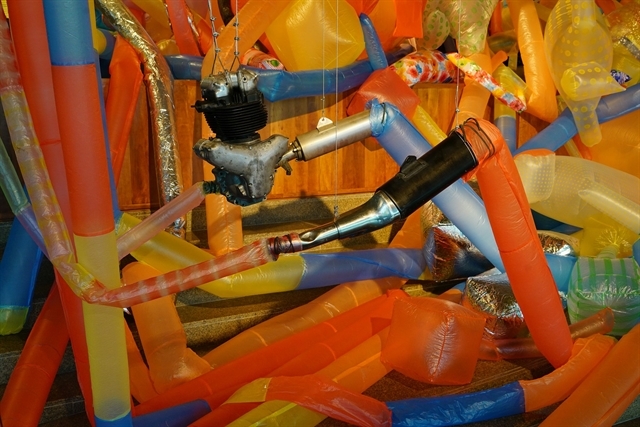 UuDam’s latest exhibit, Rồng Rắn Lên Mây – Serpents’ Tails, includes sculptures made from plastic pipes connected by plastic bags. The work reflects the artist’s ideas about environmental pollution and traffic jams in Việt Nam. UuDam uses plastic bags and motorbike’s exhaust gas to create his works. Rồng Rắn Lên Mây – Serpents’ Tails was completed in 2015 and has been displayed at several international exhibitions. For his first showcase in HCM City, UuDam wants to convey a serious message about environmental protection. Born in Việt Nam in 1971, UuDam studied at the HCM City University of Fine Arts. He graduated with a BA from the University of California, Los Angeles (UCLA) in 2001 and received his MFA from the School of Visual Arts in New York in 2005. Working creatively with video, performance, photography, sculpture, technology and new media, UuDam’s thought-provoking art practice is unique in Việt Nam’s contemporary art today. His works have been mentioned and reviewed in leading art online forums, newspapers and magazines, including Art Forum, Flash Art, Brooklyn Rail, Hyperallergic, Blouin Art Info, The New York Times and Singapore Today Top Pick.